I am ridiculously excited about the Tour again this year. I always am, I guess, but it continues to surprise me how much fun hours of watching guys try to kill themselves on the back of a bike every single day for three weeks can be. 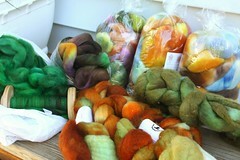 Every year I think the Tour de Fleece is a fun idea, and every year I blow it off. Not this year. I do hereby declare this the 2010 Tour de 70's Appliance Colors. My goal is a very simple one, I just want to sit at the wheel for some psychologically satisfying period of time Every.Single.Day. The secret goal that I will not actually admit to myself is to get through every single thing in this photo. I have a bit of travel right in the middle of the Tour, travel that will not be conducive to wheel transport, so I will also build in that an equivalent time with a spindle also counts.